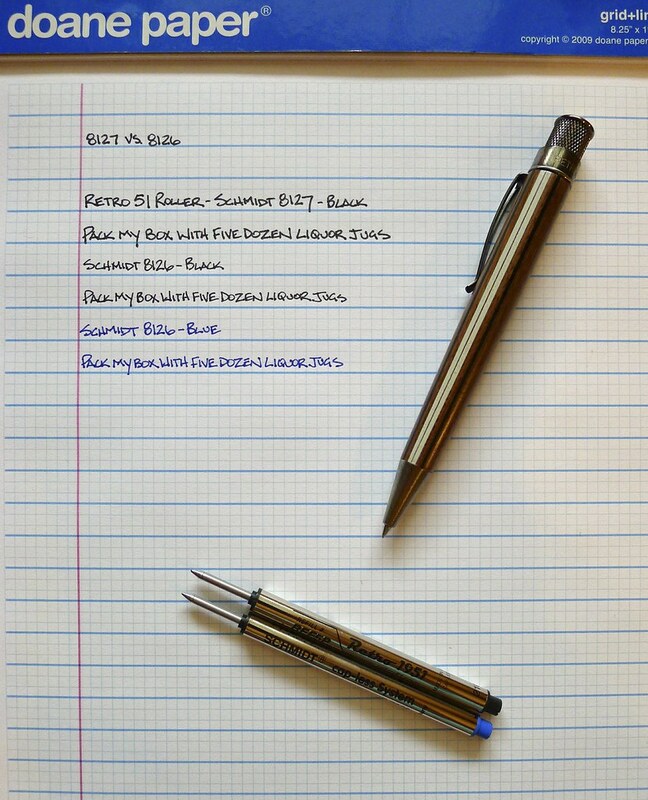 It is not often that I review just a pen refill, but in the case of the Schmidt P8126 it is warranted. Why is it warranted? In simple terms, it fits the Retro 51 Tornado. If you are unaware of the Retro 51 Tornado (review), it is one of my most recommended pens for people looking for a high quality, great looking, affordable pen. It fits a need in the $20 price range for people wanting to treat themselves or give a gift to others. I love it too, but there is one thing that has held it back ever so slightly in my personal rankings - the refill is too wide. The Tornado ships with a Retro 51 branded Schmidt 8127 roller ball refill, which has an 0.7 mm tip. In the search for a finer tip, Schmidt's own 8126 model and its 0.6 mm tip has been the most recommended replacement. I finally received a couple now that JetPens is stocking them and I couldnt be happier. I did a simple writing sample above and the difference is clear. For those of you wanting a finer refill for your Tornado that has the same qualities as the stock refill the Schmidt 8126 is the answer. Posted on August 15, 2013 by Brad Dowdy and filed under Pen Reviews, Retro 51, Schmidt.